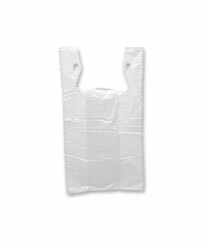 White 6" x 3"x 12"
White 6" x 4" x 15"
White 8" x 4" x 16"
White 10" x 5" x 18"
White 11.5" x 6.5" x 21"
White 15" x 7" x 26"
White 18" x 8" x 28"
White 20" x 10" x 36"
Black 6" x 3" x 12"
Black 6" x 4" x 15"
Black 12" x 7" x 23"
Black 15" x 7" x 26"
Black 18" x 8" x 26"
.65 MIL- White 11.5" x 6.5" x 21"
.55 MIL- White 11.5" x 6.5" x 22"
Retail carry-out t-shirt bags are strong, attractive, and easy to carry. 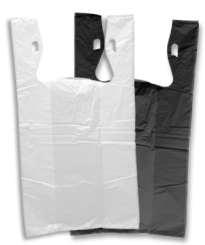 1/6 barrel-standard grocery bag size; light-weight High-Density plastic resists punctures or tears. 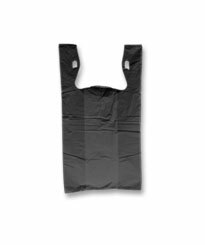 Gusseted sides give extra storage space and expandability for bulky items. 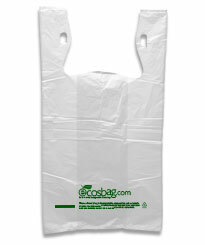 Plain Carry Out Bags are ready to ship to you today. 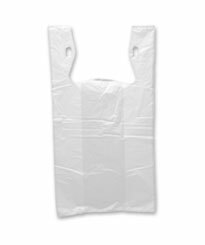 Plain white t shirt bag. 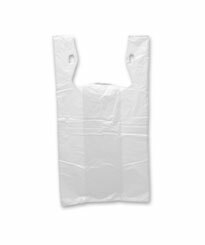 Wholesale plastic t-shirt bags plain. 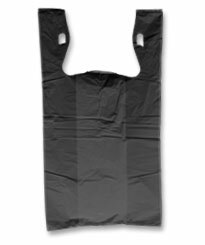 T-Shirt bags wholesale and Plain High Density Plastic Carry Out Bags are also known as: T-sacks, Vest Bags, Block Bags, and Tshirt bags. 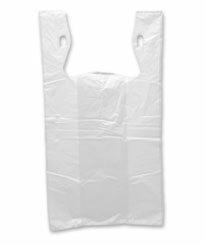 Question: What is the size or dimensions of standard plastic grocery bag? Answer: Around the turn of the 20th Century, dry goods were generally stored in barrels. In 1916, the US Congress established that a standard barrel held 196 pounds of fine flour. 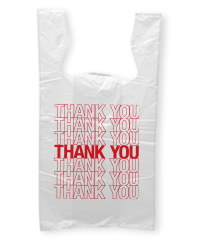 Our present day grocery bags are still measured by how much flour they hold, 1/6th barrel, 1/4 barrel, 12 pounds, etc. 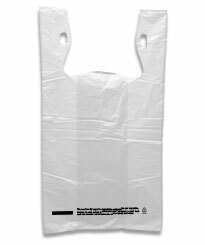 Question: what size are the plastic grocery bags that you normally find in supermarkets? 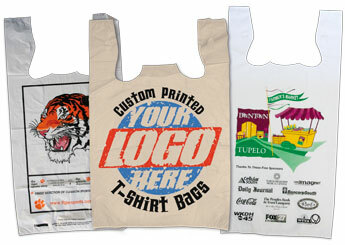 Answer: International Plastics carries all different sizes of t-shirt bags. 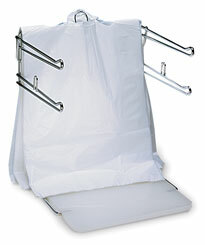 From Small to really big they have a great selection to choose from.